Birdie Brown: New Freebies & Challenge! I'd love to see what you create with these free digital stamps! Here are the details of April Freebie Challenge. Make a card/project using this month's freebies. Then upload it to your blog or online gallery (like SCS). Add a direct link to your project in the Inlinkz tool that is located at the bottom of this post. Please include a link to this post in your blog post (or gallery description) so that your readers will know where you got the image you used. Please DON'T put the original digital stamp(s) on your blog post. I have to regard it as redistribution. The collection will be closed at 11:59 pm (EST), April 30th. 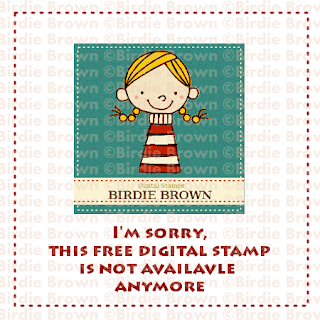 The one lucky winner will be chosen randomly and will receive three digital stamps from Birdie Brown. What a fun image and sentiments!! what a wonderful little image! Thank you very much! thank your for the fabulous freebies. they're beautiful! Thank you! It's so cute. What a fabulous freebie! Can't wait to use it in a project! Thank you, what a great image and love the sentiments too..will look forward to joining in this month..
Fabulous Torico, love it and great sentiments too! What a gorgeous card - fresh and sweet! Thank you for the fabby freebies! Thank you so much for the lovely freebies too.. Thank you for the lovely freebies. Your card is gorgeous. 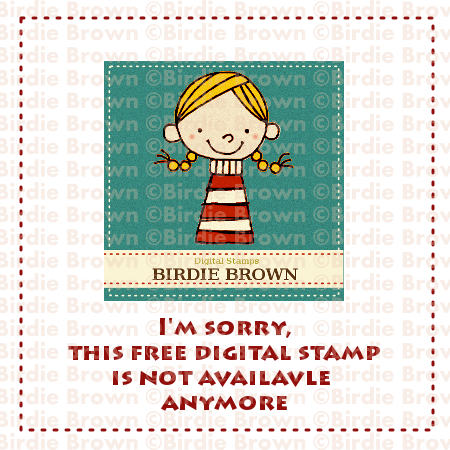 I love this digital - can't wait to create - love your card as well Birdie - thank you so much for the freebie! Enjoy your week! Love, Love, LOVE it!!! Thanks so much Torico! Your inspiration card couldn't be sweeter. Hugs! Thank you, so much! Adorable. Thank you so much for the freebies, Torico! They are adorable! I am so happy, I love these images and can't wait to use them. Your card is absoultely adorable too, thank you so much for the freebies! Just adorable!! LOVE your work so much! Ooohh, thank you so much for the Freebies. The image is soooo cute! And your card is fab! Love the pastel colours on your card. Thanks so much for the fab freebies and the Challenge. I love your sample card! thank you so much for the fabulous freebies. Your are so generous and sweet! Thank you. The sample card is beautiful. I love the soft colors. Thank you, Torico! Your sample card is just lovely! The colors are so soft, very sweet. How adorable!! Love your card! Thanks so much. This is so cute and I love the card you have made with it. Thanks so much. Thank you for the freebies. I love your card! Love your card. Thanks for the freebies. What a great image! Thanks so much for the image and sentiments! Have just discovered you...lovely images and cards! Thank you so much for the free digis. This is super cute, thanks so much. Thanks for sharing your talent w/us! This is adorable and tons of fun! Thank you it's every lovely. Thank you for these lovely freebies Torico! Love the new image Torico, thanks for sharing! Gorgeous card - looking forward to playing this time round. This is adorable, Torico! Thanks so much for sharing... I can't wait to play with this image. Love this wonderful digi, Torico...thank you so much! I love your card and image. Thanks so much! The image and sentiments are adorable, Torico! Thanks for the chance to win a free image. OMG your card is Gorgeous!!! I am soo gonna try to play along this month!!! I would love to win some Cuteness by you! Love the card,and thanks for sharing the digi image. Thanks for the really cute digi stamp, can't wait to use it! Just found your site...love it! Thanks for the adorable freebie.